We are starting the school year by welcoming the addition of Jeff Wasyln as the Owego Apalachin School Resource Officer. This is a step forward in creating a safer learning environment for our children and building relationships and trust within our community. 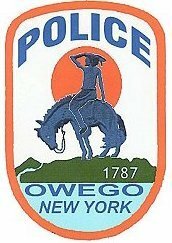 I would also like to thank the Owego Public works for hanging the memorial signs for Officer Forrest Hall, killed in the line of duty on Oct. 13, 1969 and Officer Isaac Wiltsie, killed in the line of duty on July 17, 1869. Both signs are hung on North Avenue in the area where the two officers were killed. The Police department would also like to thank Michael Phelps for assisting one of our officers in a foot pursuit of a subject that was wanted by New York State Parole. Phelps, who is an Officer in the Town of Vestal, was off duty and with his family at the time. He noticed Officer Meehan perusing a subject by himself and putting himself at risk jumped in and assisted Officer Meehan so that he would not be alone during the chase. We would like to thank Dan Gavin for assisting Officer Meehan in the arrest of a subject for Menacing. Gavin, who is a police officer in Johnson City, was off duty and noticed Officer Meehan was by himself and attempting to apprehend a suspect. Gavin assisted Meehan in taking the subject in custody. The community should be proud of the actions taken by these two off duty Police Officers in ensuring the safety of our community. The patrol vehicle that we purchased has been delivered and is currently being equipped for road patrol. We should see this vehicle in our fleet within two weeks. For the month of August we had 372 total calls for service, made 21 arrests, assisted at 17 accidents, issued 27 traffic tickets and 21 traffic-warning tickets, and 19 parking tickets.